Even though keyboardist Tim Carmon has played with the likes of B.B. King, Eric Clapton, Babyface, Buddy Guy, Stevie Wonder, Gladys Knight, and Macy Gray, he may be best known to millions for his daytime television roles, such as the piano-playing Kip on The Young and the Restless. But Carmon insists that he is always a musician first. "I'm not afraid of the camera," shrugs the Washington, D.C., native. "I'm very jolly, and I can get into clown mode real quick. But even my television roles involve music. I've been making my living at music since age 14. I grew up in a musical family, so it's in my blood. My mom plays, and so do most of my seven brothers and sisters. The whole piano thing started for me when I'd have competitions with my sister to see who could pick out the most cartoon themes on the keyboard. I played a lot in church, too, and that's still a big part of my playing. When Marcus Miller tells cats about me, the first thing he says is that I have a church feel. If you put an organ in front of me, you're definitely going to hear it!" While Carmon, 28, works chiefly in blues and R&B, his sound trades heavily on rich, added-note harmonies and imaginative chord substitutions. "I love lush chords," he says. "That's my thing-give me a palette of chords, and I am going to take it somewhere else. I guess you could say it's a jazz influence. I don't know for sure, though I definitely listened to jazz cats like Art Tatum, Oscar Peterson, and Phineas Newborn when I was growing up." Carmon earned his stripes on the hardscrabble R&B circuit. "I learned so much from playing small gigs with some of those one-hit wonders. I swear, man-those were definitely some of the baddest cats I have ever worked with." Eventually, Carmon landed a gig with Midas-touch singer/songwriter/producer Babyface. In fact, he first met Eric Clapton, his current employer, during Babyface's MTV Unplugged show. "Eric said, 'I hope we play together sometime,' and I said, 'I do too!'" laughs Carmon. "Eventually Nathan East brought me into the group, and I've been playing with Eric now since 1998." Carmon calculates that he spends about half his playing time on piano and organ, and about half on synth. "With Eric," he notes, "I definitely play a lot more organ, piano and electric piano than synthesizer. For piano sounds, I really like the Yamaha P200. The keyboard feel is so realistic, it's sick. The pitch, the resonance, the moaning aftertones you get after you release the keys-it has all of that. For our last VH1 show, I had the choice between a baby grand and the P200, and I chose the P200-that says a lot! And for me, the best electric piano is the Yamaha S80. I use some of its phase-shifted Rhodes sounds an awful lot. I also do a lot of synthesizer programming on it." 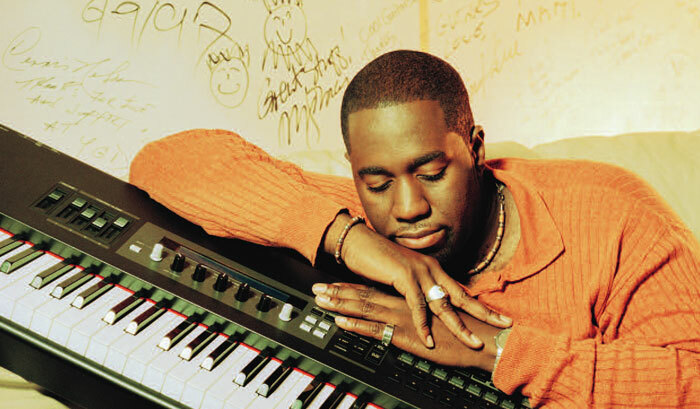 But when it comes to soloing, Carmon says he is reluctant to mix synth and acoustic sounds: "I tend go into a sort of George Duke/Herbie Hancock solo-synthesizer mode. I just like the idea of letting a synth sound like a synth during a solo, as opposed to imitating an acoustic instrument." And what was it like to play alongside B.B. King on "Riding with the King", last year's Clapton/King collaboration? "That is one of the events I will never forget in my life," intones Carmon. "B.B. was killing me! I almost cried. I actually had to stop playing at one point. Man, B.B. has so much amazin' soul. And to be still playing like that after 75 years-unbelievable! Eric teases me sometimes, because when I get excited, I sometimes scream out. Well, we had to do one entire take over because B.B. was killing me so much, he made me scream."